We are a leading manufacturers / suppliers for high quality powder coating equipment for Birmingham, The Midlands, The UK and indeed around the world. Our aim is to provide you with the best system for your application, while providing a cost effective solution to meet your overall business plan. The end result is a satisfied clientele that continues to turn to us for helping them achieve maximum productivity in today’s competitive manufacturing market. At PB we fabricate and setup reliable powder coating equipment of the highest quality that is uniquely tailored to your requirements at the best possible value and delivered ON TIME! No job is too big or too small – PB Finishing can cater for any size of powder coating plant and assist in the process that best suits your requirements. Working in close partnership with our material suppliers, you can rely on the exceptional service and short lead times that keep PB Finishing a leader in the industry. As part of the powder coating equipment that we supply, we can provide you with general purpose ovens for just about any application. Our ovens are diverse in size and application ranging from small standard models to custom built installations. They can be supplied as a conventional batch oven or a production conveyor based version. Temperatures are available from 50°C to 500°C. Most ovens are built using our modular design which allows us to construct just about any size and shape of unit to suit your needs exactly. Drying ovens are used following any cleaning and pre-treatment that has been carried out before any paint or powder is applied. Our industrial ovens are custom manufactured to your production rate, curing cycle, and layout requirements. They can be configured to accommodate single pass or multi-pass conveyor systems depending on your requirements. These ovens use an accelerated increase in temperature to cure or ‘gel’ a powder coating which significantly lowers the loss of powder and decrease required for curing. They serve as an economical way to raise product surfaces to high temperature when short process cycles are the objective or where higher temperatures can optimise a process. Curing ovens are the ideal choice if you are restricted in terms of the amount of floor area you have. They are an economical solution that can handle a variety of parts simultaneously regardless of their thicknesses, shape, size and setup. Convection equipment is a well established method of heating that can be precisely controlled in terms of temperature and curing time. They are designed to maintain an even, uniform finish from start to finish resulting in the highest possible standard of curing. Infra-red curing ovens generate more efficient curing cycles which enable the size of the oven to be significantly smaller. These ovens are therefore more economical than typical convection based ovens. At PB Metal finishing, we can thoroughly fulfil your requirements by offering a variety of powder coating equipment including spray and powder batch systems. We provide all the support you need at every stage whether you are a establishing a new finishing facility or seeking to increase your existing setup. 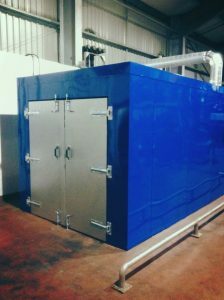 At PB, we design and fabricate powder based and liquid spray booths to suit any setup. Whatever you require to be powder coated or painted we can supply the ideal spray booth to meet your individual requirements at the best possible value. All of our equipment is built to meet every industrial regulation and safety standard. Each unit is constructed of the highest quality materials and parts that guarantee reliable and safe products, proven to increase your efficiency and profit. Batch cartridge booths are a clean, flexible and efficient solution for batches and short-runs of manual and custom-colour powder coating requirements. These booths are a modular, smaller solution ideal for short and medium sized runs. They feature cartridge-filter technology which provides a high level of material usage and have the benefit of a fast paint colour change system. We can customise the design of the batch booth for automatic spraying applications. The booths are comprised of a closed loop and automatic powder recycling system that enables the most economical material use. 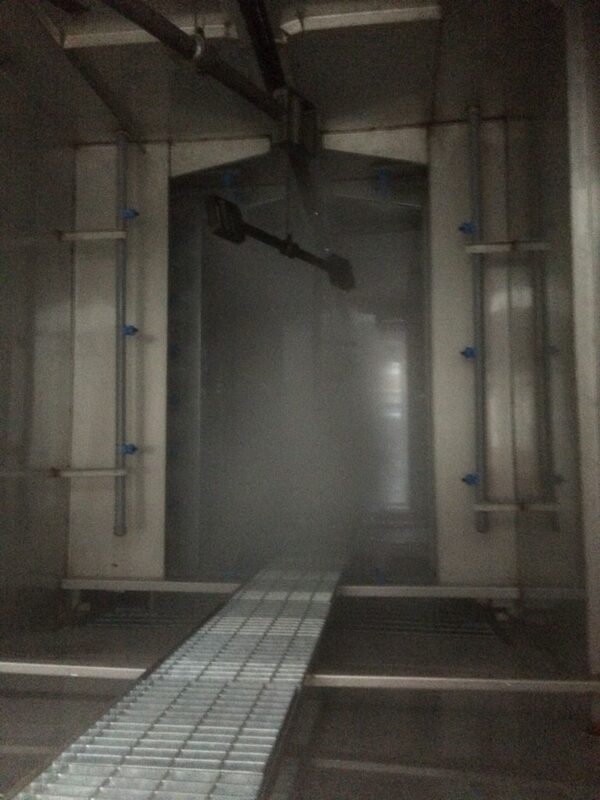 This system also lowers the amount of contamination and serves as a safer and cleaner solution. They also have a modular build which is designed to reduce the amount of space required. 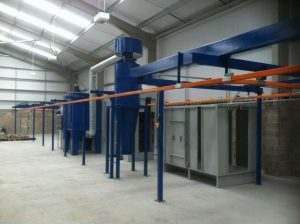 We design the Dry Filter booths for many finishing applications. We offer both open face type and conveyor based models. We can also design a custom dry filter booth specifically for your application. Front filter doors, air make-up systems and special spray booth controls can all be integrated into the design. Water booths provide an extremely efficient means for extracting particles of paint present in exhausted air by making use of water to serve a as means of filtration. These type of booths are commonly used for runs requiring large volumes of paint. They can also safely use a wide variety of paint types with varying degrees of drying speed and viscosity. Our water booths are designed for many different finishing requirements. At PB, we can supply pump and non-pump based versions with either enclosed, conveyor and open face models. We can also incorporate air make up systems, filter doors, sludge dewatering and specialist booth operating controls into our designs. These cartridge booths are suited to high volumes of metal finishing and non-metal based items that require grinding. They can have removable drawer powder or fluidized bed recovery systems. The booths feature blowers, motors, final filters, cartridge filters, manometer, solenoid valves, light fixtures, a complete wired control panel and assembly instructions. The most critical step in obtaining a quality finish in any finishing activity is the effective pre-treatment (e.g. cleaning) of the product. The quality of the surface preparation process and equipment sets the standard for all subsequent operations in a finishing system. The majority of industrial coatings requires the thorough cleaning of all dirt, oils, and contaminants from the product surface and treating the product surface with an iron phosphate or conversion coatings to prevent corrosion and increase paint / powder adhesion. Our powder coating equipment also covers continuous spray pre-treatments which are by far the most common way of preparing metal surfaces for finishing. This equipment, normally conveyor based, are ideally suited for high capacity plants because of its adaptability. Tunnel type pre-treatments use a water based, multiple step process to prepare surfaces. For both small and large items, overhead conveyors are used to suspend the parts from hooks or racks. These then traverse through the equipment where they are covered with a variety of solutions, sometimes heated to 60oc, which re-circulate via storage tanks for use at each stage. Dip tanks are a variation of and work similarly to spray washing. Immersion pre-treatments are commonly needed for intricate parts that aren’t best served by only using spray methods. The Box washer system is configured to meet the most stringent requirements in today’s pre-treatment market. The washer systems are manufactured to customer requirements and can be in-line or off-line design, having as many stages as required operating on a single work chamber. These box washer systems can be used wherever one or more aqueous process needs to be applied to a given product. Cleaning, phosphating, rinsing and sealing would be an example of such a multi-stage process. The number of stages is determined solely by the process requirement. Much of the flexibility of this system stems from the single treatment chamber, which saves space over conventional in-line systems with separate chambers and annexes between. Flexibility is gained by having totally controllable process and drain times which would otherwise be a fixed feature, determined by chamber and conveyor length and speed of travel. There is a reduction in capital and installation costs and longer-term savings on energy and maintenance costs, including both equipment and people. The range of machines provides a compact installation compared to conventional treatment methods, saving floor space and giving more efficient use of treatment chemistry. These systems allowing the most economic process times to be set for the work and its condition. They also eliminate losses and quality problems caused by over-spray. PB Metal finishings is dedicated to the continual progress in conveyor design. Having a close relationship with a range of conveyor companies, we are able to choose the best conveyor system for your requirements. We are offer installation, breakdown, servicing and spares to most overhead & belt conveyor systems. This medium capacity chain conveyor is highly compact and specifically designed for use in small spaces. To convey through your existing manufacturing and production equipment or up and over an aisle-way quickly, no other conveyor system can match the C-250 for versatility. For power and free conveying, there are numerous compact, enclosed track conveyors that can be used slot down or slot up (inverted power and free). Free trolleys have flippers so the conveyor can be inverted. A simple drive dog design allows you the fastest cycle times in combination with wheel-turn/take-up drive, saving time and money. Our Range of enclosed track chain conveyors are designed for stability in conveying heavy duty loads; up to 220 lbs from a single pendant. These have the largest track cross-section for added stability in carrying heavy loads. We can offer unique “+” shaped track sections to allow for slot-up (inverted), slot sideways or slot down applications. Overhead I-Beam conveyors are proven to generate the smallest amount of cost per pound of capacity compared to all other overhead conveyors. We fabricate I-beam conveyor rails in 3”, 4” and 6” versions. They are ideal for rugged, long term use featuring a welded, rivet-less construction and have an open style track combined with a drop forged chain to provide large amounts of flexibility and require no tools for set up. For more information on any of our powder coating equipment, or any other services that we offer, please call our team on 0121 522 3513. Our light duty systems are ideal for any light or medium weight conveyors, allowing you to manage various products in any industry with complete confidence. These conveyor systems can handle any weight between 15kg to 100kg on each attachment on a multitude of conveyor angles. They can work in an operating environment of up to 250°C and use current technology, shot style lubricators to make sure operation remains reliable. Additional weight can be accommodated for by including a load bar to join together two pendants. Our range of Open chain Medium Duty conveyors are designed expertly with medium and heavy loads in mind. They can operate with higher amounts of chain pull. Medium duty conveyors can cope with carrying weights between 90kg all the way up to 545kg. Using a dual wheel trolley construction they can cope with different pitches of carrying. The Contamination Free range of conveyors has been specifically designed to eliminate the risk of product contamination. These conveyors utilise a ‘C’ shaped hanging pendant which are attached to the conveyor chain through a side mounted slot on the conveyor track, as opposed to the bottom as with conventional type chain conveyors. Offer carrying capacities up-to 75kg, at varying product pitches. The power & free range can be used across all areas of industry to handle light, medium and heavy duty product types. A universal cross section conveyor can handle unit loads of up to 300kg. This conveyor is represented by the top half of the above image. These can be integrated into a turnkey automation process or operate as a self-contained system. They quicken changes to interface with operation processes and automatically route products.